The motto appears on a scroll beneath the shield of the "English" (non-Scottish) version of the Royal coat of arms of the United Kingdom. Dieu et mon droit (French pronunciation: ​[djø e mɔ̃ dʁwa]), meaning "God and my right", is the motto of the Monarch of the United Kingdom outside Scotland. It appears on a scroll beneath the shield of the version of the coat of arms of the United Kingdom. The motto is said to have first been used by Richard I (1157–1199) as a battle cry and presumed to be a reference to his French ancestry and the divine right of the Monarch to govern. It was adopted as the royal motto of England by King Henry V (1386–1422) with the phrase "and my right" referring to his claim by descent to the French crown. The motto is French for "God and my right", meaning that the king is "Rex Angliae Dei gratia": King of England by the grace of God. It is used to imply that the monarch of a nation has a God-given (divine) right to rule. 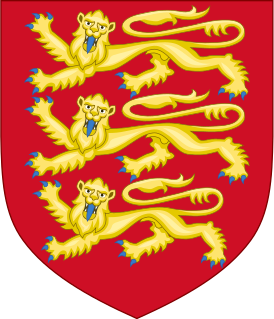 For the Royal coat of arms of the Kingdom of England to have a French rather than English motto was not unusual, given that Norman French was the primary language of the English Royal Court and ruling class following the rule of William the Conqueror of Normandy and later the Plantagenets. Another Old French phrase also appears in the full achievement of the Royal Arms. The motto of the Order of the Garter, Honi soit qui mal y pense ("Spurned be the one who evil thinks"), appears on a representation of a garter behind the shield. Modern French spelling has changed honi to honni, but the motto has not been updated. Dieu et mon droit has been translated in several ways, including "God and my right", "God and my right hand," "God and my lawful right," and "God and my right shall me defend." The literal translation of Dieu et mon droit is "God and my right". However, Kearsley's Complete Peerage, published in 1799, translates it to mean "God and my right hand" (in standard French that would be Dieu et ma main droite, not mon droit). The Kearsley volume appeared during publication of the 1st edition (1796–1808) of the German Brockhaus Enzklopädie, which emphasised the raising of the "right hand" during installations and coronations of German Kings. Diderot's Encyclopédie lists the motto as Dieu est mon droit, translated as "God is my right". Dieu et mon droit has generally been used as the motto of English monarchs, and later by British monarchs outside Scotland, since being adopted by Henry V. It was first used as a battle cry by King Richard I in 1198 at the Battle of Gisors, when he defeated the forces of Philip II of France and after he made it his motto. The belief in medieval Europe was not that victory automatically went to the side with the better army but that, as with personal trial by combat, to the side that God viewed with favour. Hence Richard wrote after his victory "It is not us who have done it but God and our right through us". So after his victories on the crusades "Richard was speaking what he believed to be the truth when he told the Holy Roman Emperor: 'I am born of a rank which recognises no superior but God'". Alternatively, the Royal Arms may depict a monarch's personal motto. For example, Elizabeth I and Queen Anne's often displayed Semper Eadem; Latin for "Always the same", and James I's depicted Beati Pacifici, Latin for "Blessed are the peacemakers". Dieu et mon droit has been adopted along with the rest of the Royal Coat of Arms by The Times as part of its masthead. When it incorporated the Coat of Arms in 1875, half the newspapers in London were also doing so. Since 1982 the paper abandoned the use of the current Royal Coat of Arms and returned to using the Hanoverian coat of arms of 1785. Versions of the Coat of Arms, with the motto, are used by Nottingham City Council as its logo, and by various newspapers, including Melbourne's The Age in Australia, Christchurch's The Press in New Zealand, the UK's Daily Mail, and Canada's Toronto Standard. It is also used in Hardwick Hall in England on the fireplace of The High Great Chamber, also known as the Presence Chamber - however it reads “Dieu est mon droit” instead creating an additional ‘ES’ monogram. The extra E and S are a superimposition on the original E. This was added at a later date after the original writing was put up; to deface the Royal Arms would have been very dangerous, hence why it was added later. It is also found on the official belt buckle of the Jamaica Constabulary Force; the front page of a British passport; the rank slide of a warrant officer in the British and other Commonwealth armed forces; the arms of the Supreme Court of Victoria and Supreme Court of NSW; and the crests of Hawthorn Rowing Club in Melbourne, Australia, Nottingham Law School and Sherborne School. The coined phrase was also used by Michael Jackson at his Neverland Ranch's front gates. The crest on the main gates carried the Royal Coat of Arms of the United Kingdom, along with the phrase at the bottom. The motto was formerly included in a scroll on the Western Australia Police Force coat of arms, before being replaced with "Protect and Serve" when the organisation changed its name from Western Australia Police Force to Western Australia Police Service. It is the motto of Queen Elizabeth's School, Barnet. It is also found on the Old Customs House in Sydney Australia. The Royal Coat of Arms is intricately carved in sandstone, located above the main entry pediment. The motto with the Royal Coat of Arms was used by the LONDON GAZETTE paper as seen in this cover page dated August 26, 1768. Lt James Cook's commencement of a South Pacific seas adventure, aboard the ENDEAVOUR BARK, is the major headline. The 250th anniversary of this historic excursion launch takes place in 2018. The Hearts of Oak, a revolutionary New York militia commanded by Alexander Hamilton, wore badges of red tin hearts on their jackets with the words "God and Our Right". The phrase was the inspiration for a joke motto by The Beatles, Duit on Mon Dei ("Do it on Monday") and Harry Nilsson's 1975 album Duit on Mon Dei. Henry Hudson in 1612 used the wording "Dieu est mon droit" (God is my right). Other people considered the phrase "Dieu est mon droit" (God is my right) means he was direct sovereign and not vassal of any other king. Another example of "Dieu est mon droit" is inscribed under the royal coat of arms on the over mantle of the High Great Chamber in Hardwick Hall, Derbyshire. ^ a b "Coats of arms". The Official Website of the British Monarchy. Retrieved 25 April 2009. ^ a b c d e f g h i Morana, Martin (September 2011). Bejn kliem u storja: glossarju enċiklopediku dwar tradizzjonijiet – toponimi – termini storiċi Maltin (in Maltese). Malta: Best Print. p. 59. ISBN 978-99957-0-137-6. OCLC 908059040. Archived from the original on 5 October 2016. ^ a b c Juliet Barker (2 September 2010). Agincourt: The King, the Campaign, the Battle. Little, Brown Book Group. p. 24. ISBN 978-0-7481-2219-6. ^ Ted Ellsworth, Yank: Memoir of a World War II Soldier (1941–1945), Da Capo Press, 2009, p. 29. ^ Tony Freer Minshull, The Foley Family Volume One, Lulu.com, 2007, p. 114. ^ The Journal of the British Archaeological Association, vol. 17, British Archaeological Association, 1861 p. 33. ^ Henry Shaw, Dress and decoration of the Middle Ages, First Glance Books, 1998, p. 92. ^ Dresses and Decorations of the Middle Ages, vol. 1, William Pickering, 1843, section 2. 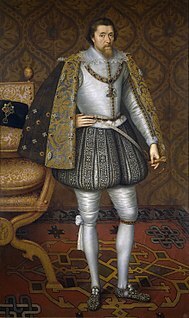 ^ Kearsley's Complete Peerage, of England, Scotland, and Ireland. 1799. p. xxiii. Retrieved 25 April 2009. ^ Mary Ellen Snodgrass (2003). 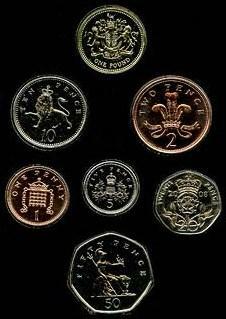 Coins and Currency: An Historical Encyclopedia. p. 227. ^ "God is my right". Retrieved 1 April 2015. ^ a b c Pine, Leslie Gilbert (1983). A Dictionary of mottoes. Routledge. p. 53. ISBN 978-0-7100-9339-4. ^ Norris, Herbert (1999). Medieval Costume and Fashion (illustrated, reprint ed.). Courier Dover Publications. p. 312. ISBN 0-486-40486-2. ^ Hallam, Elizabeth (1996). Medieval Monarchs. Crescent Books. p. 44. ISBN 0-517-14082-9. ^ Watkins, John (2002). Representing Elizabeth in Stuart England: literature, history, sovereignty (illustrated ed.). Cambridge University Press. p. 206. ISBN 0-521-81573-8. ^ Biden, William Downing (1852). The history and antiquities of the ancient and royal town of Kingston upon Thames. William Lindsey. p. 6. ^ Staff (25 January 2007). "FAQ: infrequently asked questions: The Times and Sunday Times are newspapers with long and interesting histories". The Times. ^ Max Davidson (30 June 2009). "State vs independent schools: Sherborne, Dorset". The Telegraph. ^ Brian Mills (4 May 2012). "A Night Inside Michael Jackson's Abandoned Neverland Ranch". Fierth Magazine. ^ Chernow, Ron. Alexander Hamilton. Penguin Press, (2004) (ISBN 1-59420-009-2). ^ "[Illustrations de Descriptio ac delineatio geographica detectionis freti supra terras Americanas in China atque, Japonem ducturi] / [Non identifié] ; Henry Hudson, aut. du texte". 26 December 2017 – via gallica.bnf.fr. ^ La Porte, Joseph de (1714–1779) Auteur du texte. "L'esprit de l'Encyclopédie, ou Choix des articles les plus curieux, les plus agréables, les plus piquants, les plus philosophiques de ce grand dictionnaire..." Le Breton – via gallica.bnf.fr. The Court of Final Appeal Building, also known as the Old Supreme Court Building (舊最高法院大樓), is the home of the Court of Final Appeal of Hong Kong. It housed the former Supreme Court from 1912 to 1983 and the Legislative Council from 1985 to 2011. It is located at 8 Jackson Road, in Central, along the eastern side of Statue Square, directly west of Chater Garden. As the Old Supreme Court, its exterior is one of the declared monuments of Hong Kong. King Edward VI School is a selective co-educational independent school founded in Southampton, United Kingdom, in 1553. 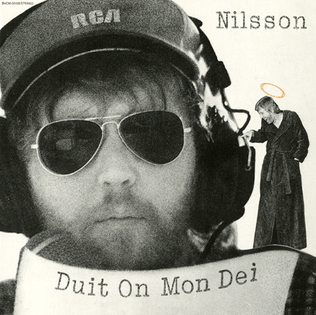 Duit on Mon Dei is the eleventh album by Harry Nilsson. The original title for this album was God's Greatest Hits but RCA didn't approve. The title is a punning spelling of "Do It On Monday," playing on the British Monarchy's motto Dieu et mon droit. It was originally used on the cover of Ringo Starr's 1973 album Ringo. A slogan is used in Scottish heraldry as a heraldic motto or a secondary motto. It usually appears above the crest on a coat of arms, though sometimes it appears as a secondary motto beneath the shield. The word slogan dates from 1513, though it is a variant of the earlier slogorn, which was an Anglicisation of the Scottish Gaelic sluagh-ghairm.